This is your weekly reminder about the July 7th Hirhurim get-together/dinner (link 1, link 2, link 3). All readers, commenters and friends of the blog are invited to this free event. 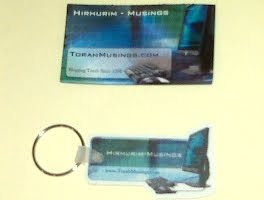 That picture you see on the right is of two more trinkets that we will be giving out for free at the get-together: keychains and refrigerator magnets. Limited quantities of each so get there early -- while supplies last. Please RSVP to the event using this online form: link. Thank you.